Brad Jensen, a six-and-a-half-foot-tall retired military officer, isn't the type of guy you'd expect to become emotional very easily. But get him talking about his at-risk students. "They realize that they can succeed, and that's huge," he said, getting visibly choked up. At the end of what was just his second year in the classroom, Jensen was named Teacher of the Year at Hinckley-Finlayson High School. His zeal, along with the training he received at St. Scholastica's Graduate Teaching Licensure program, set him up for success when he was hired at the school's alternative learning program for at-risk youth. During his 26-year Air Force career, he enjoyed his work as a trainer. After he retired, he decided to use the G.I. Bill to pursue a teaching career. He enrolled in St. Scholastica's flexible GTL program, structured with online courses and on-campus meetings held every other weekend. The choice paid off. "The program was just outstanding. Every instructor had either high school or elementary school experience." 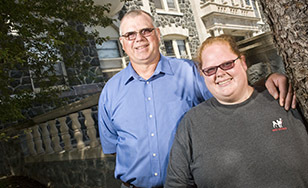 Jensen's daughter, Annikka, is picking up where he left off: she started the GTL program in fall 2014. "Dad kept talking about how great it was," she said. After completing the GTL program, Jensen started teaching at the alternative school. "We take students that are pretty much shut down from school. We try to get them back to at least getting their high school diploma." The work goes far beyond academics, as teachers must build relationships of trust with their students. "We work with them to try and show them that they can succeed," Jensen said. "Then they start coming around." It's a rewarding transition to witness. "The kids come in all tough. Later on, they're just great." His secret to breaking through? "Listening to them," he said. "You are just there. You're a constant." Central to his teaching philosophy, he said, are the three C's that he learned at St. Scholastica: Content, character, and caring. "Always show them that you care," he said. "For a lot of those students, they don't get that anywhere else."